Nationwide fast-food strikes are ramping up today, as thousands of low-wage restaurant workers are walking off the job, demanding the right to organize and wages as high as $15 per hour. The issue of fast-food worker pay has been in the news a lot lately, after McDonald’s published a much maligned sample budget for its low-income workers that more or less proved how impossible it is for minimum-wage workers to support themselves, let alone a family. This story was followed by a now debunked report from the Huffington Post that argued that McDonald’s could double its restaurant workers’ pay by simply raising the price of a Big Mac by 68¢. Henry Blodget of Business Insider took the argument further, writing that McDonald’s profits are so healthy that it could afford to raise wages without raising prices — and still remain profitable. As Ryan Chittum of the Columbia Journalism Review points out, this ignores the fact that most McDonald’s employees work for franchises, rather than the parent company, and that these franchises have a much lower profit margin than their corporate parent. That being said, a profit margin of 4.6% isn’t huge. At least, it’s not the sort of profitability that would allow most firms to double their wages. But it does show that whatever success these companies are having, they aren’t sharing it with employees. And this isn’t just a problem with the fast-food industry. This comes at a time when wages have been almost completely stagnant. 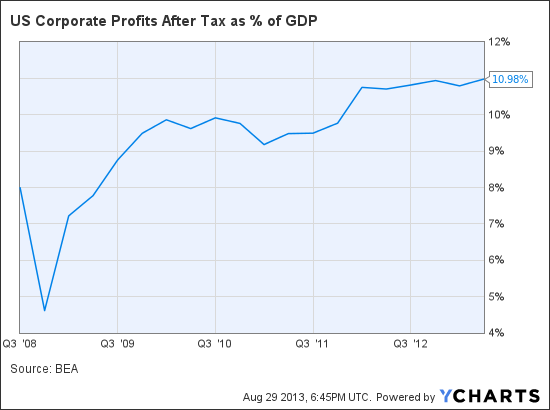 And corporate profit margins across the board have soared in recent years, while the median worker’s pay has stayed flat. Regardless of how profitable McDonald’s is or isn’t, it’s clear that in the aggregate, many businesses could afford to pay their workers more. Can you really blame fast-food workers for realizing this fact and trying to force their bosses to share some of corporate America’s good fortune?